We often receive calls and e-mail about antifreeze and water treatment. We even added a White Paper on flow center pump longevity last summer, based upon the number of inquiries. However, antifreeze properties, and especially water treatment can be confusing. For example, did you know that methanol does not have any inhibitors? So, we added a new Calculator for antifreeze freeze protection (see screen shot below) and specific gravity that also includes recommended inhibitors. 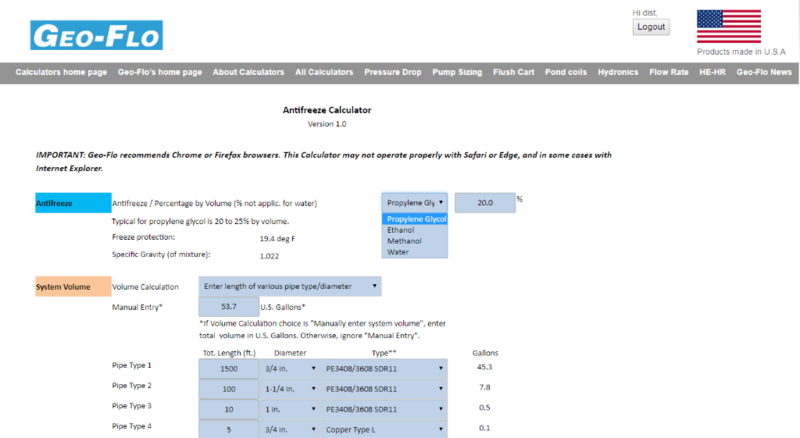 A link has been added to the "Pressure Drop Calculators", "Pump Sizing Calculators", and "Hydronic Calculators" sections. This new Calculator is great for systems in the South, where antifreeze is not used, and for systems with less concentration of propylene glycol than recommended for the required amount of inhibitors. For example, most brands of propylene glycol require a 30% concentration to provide the proper amount of inhibitors. However, propylene glycol in this concentration is viscous at lower temperatures, resulting in higher pump Watts and low Reynolds Numbers. Usually, a 30% mixture is much more than needed for adequate freeze protection in a ground loop. So, the addition of inhibitors allows the use of less propylene glycol, while still protecting the system. Geo-Flo works with Fernox on a regular basis for assistance in water treatment. Their F1 protector helps to protect the system by adding the correct amount of inhibitors, as well as treat pH level and other chemical imbalances. About 50% of Geo-Flo's warranty claims are water-quality related. Good quality water or antifreeze mixture can add years to the pump life. However, not all treatment is the same. There are some "Loop Conditioners" on the market that use sodium silicate, which is a coagulant that can cause sediment deposits, scaling, and possibly heat exchange issues and/or plugging of pump passages. Easy to use test kits can help determine a water treatment plan. A nice segue from antifreeze and water quality is the Geo-Booster. Pressurized loop systems can benefit from this active pressurization device, which provides storage of pre-mixed water/antifreeze in the 1 gallon (3.8 liter) tank for use in maintaining system pressure with a small diaphragm pump and check valve. The sealing cap ensures a closed system, prevents fluid evaporation, and provides vacuum relief. The sight glass is an easy way to check fluid level in the tank. Don't forget about the International Ground Source Heat Pump (IGSHPA) Association Conference in sunny Orlando, March 27 to 28. There are always a lot of good speakers and training sessions. Our OEM customers (heat pump manufacturers) will have information about Geo-Flo products, as well as our new representative in the Northeastern part of the U.S., B.J. Terroni. Pete Prydybasz of B.J. Terroni will be speaking at the conference about selling geothermal systems in his presentation, Field of (Loops) Dreams -- If You Build It, Will They Come?, which addresses the importance of helping homeowners and building owners understand the benefits of geothermal, including the concept of a ground loop as the purchase of a renewable fuel asset. We hope to see you there!